This clip is new NOS Plymouth Clip. 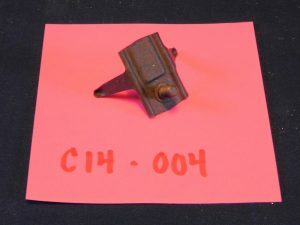 This is a 1946-1948 Plymouth Front Fender Molding Clip and they are not being made today so are in limited supply. Possibly used on other vehicles. In this case I am sure of the Plymouth application and I would think possibly Dodge also. The flat plate portion of this clip is 1 1/8 in. long. The screw is 3/8 in. long found on one end of the plate not centered as shown in the picture. There are 2 ears that face the molding at an angle and stand up 5/8 in. tall.